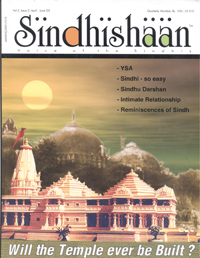 It was on Chetichand 26th March 2001 – that the inaugural issue of Sindhishaan – Voice of the Sindhis was launched. That we have successfully completed two years is obvious, but the question whether GAINFULLY COMPLETED – the objective being the promotion of Sindhiat amongst the post-partition generation, is for you readers to answer. Personally, I feel satisfied to the extent that I have witnessed a lot of happenings in the “Movement for Revival” in the last 2 years amongst like minded organizations and individuals – more seminars, more get-togethers, more cultural gatherings, more recognition of Sindhi talent in the literary and other fields, greater efforts to teach the language – all with noble and laudable objectives. Yet the cohesiveness is somehow missing. The stirring and churning is obvious, but a focus or direction seems to be lacking. To my mind the need of the hour seems to be dedicated, talented and charismatic leadership, to guide the energy towards its goal. Let us hope and pray for such leadership to emerge soon, to enable us to cover the balance of the journey and be able to say WE HAVE ARRIVED! The month of March has once again shown that senseless acts of violence seem to be the prerogative of only mankind – the most advanced, intelligent and civilized species occupying planet Earth. I cannot bring myself to accept that God or Nature ordained that one of the causes of death amongst mankind be ‘War’. War is war – whether for conquest or for liberation. The sorrow, frustration and anger of a mother who’s lost her son is the same whether she is in Washington, London or Baghdad. So without getting into justifications or provocations, let us pray that the ongoing war in Iraq comes to an early end with minimal loss of lives and let’s contribute to whatever extent one can, towards the welfare and rehabilitation of innocent civilians who have lost their hearth, home and loved ones. In India the two volatile issues which could cause a flare up are Kashmir and Ram Mandir/Babri Masjid. In Vol. 1 Issue 5 Oct-Dec. ’02 of Sindhishaan, we had carried an interview with Shabir Ahmad Shah on the Kashmir issue and in this issue we are carrying views of a few prominent members of our society, on the Ram Mandir/Babri Masjid controversy. Let’s sincerely hope and pray that both issues get resolved peacefully. With best wishes on account of Chetichand – our New Year, falling on 3rd April.